Editor: You were one of the earlier uchideshi at the Aikikai. What year did you start? When I joined as an uchideshi only Tamura Sensei and Arikawa Sensei were there. Yasuo Kobayashi was still in college. He came to the dojo every day. I entered when I was 17. I am 53 now, so it must have been 1955. 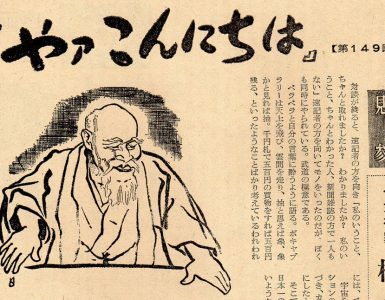 Was Doshu [Kisshomaru Ueshiba] still working for the Osaka Shoken Company? No, he had just quit. When I joined, [Kisaburo] Osawa Sensei wasn’t at the dojo yet. He had stopped for a while and was doing business. 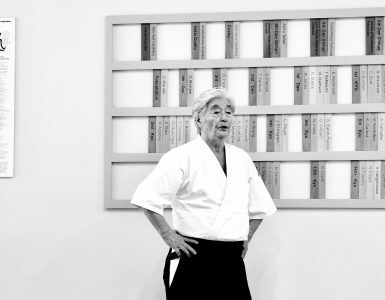 Tomiki Sensei was still coming to teach once a week. Hiroshi Tada Sensei was already teaching in the afternoon. 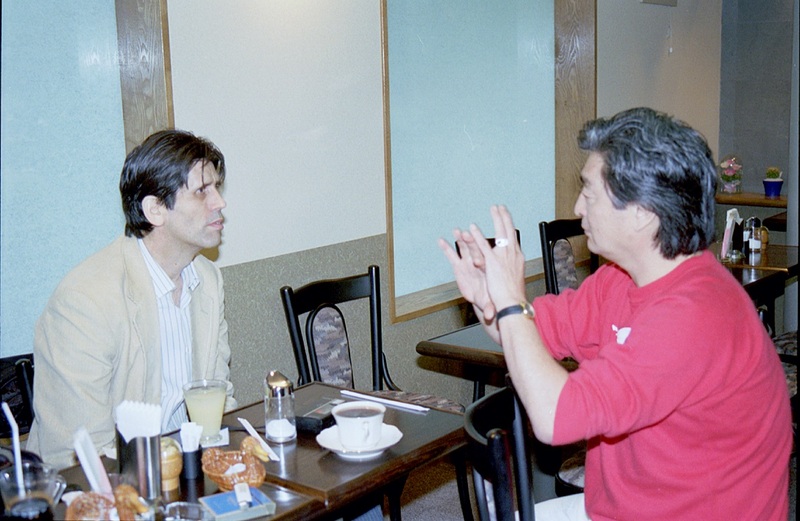 Was Seigo Yamaguchi Sensei also there at that time? He was there, but right after I joined he was sent to Burma. I never had a chance to talk with Tadashi Abe Sensei. You are his cousin, is that right? What is your relationship? Actually, I’m his second cousin. My father and he were cousins. However, my father’s parents passed away when my father was seven years old. My father was adopted by Abe’s family, so I called Abe “Uncle.” Even though they were cousins, they were raised like brothers. Yes, quite close. Before he went to Paris, he wrestled at Waseda University. He was in wrestling too? Yes, he was in the Waseda University Wrestling Club. He took wrestling because he never could beat Koichi Tohei Sensei. He said he wanted to study something new in order to beat Tohei. They were still close at that time, as uchideshi. When I was in junior high school, Abe’s home was in Osaka because his father was an important businessman in the Osaka area. 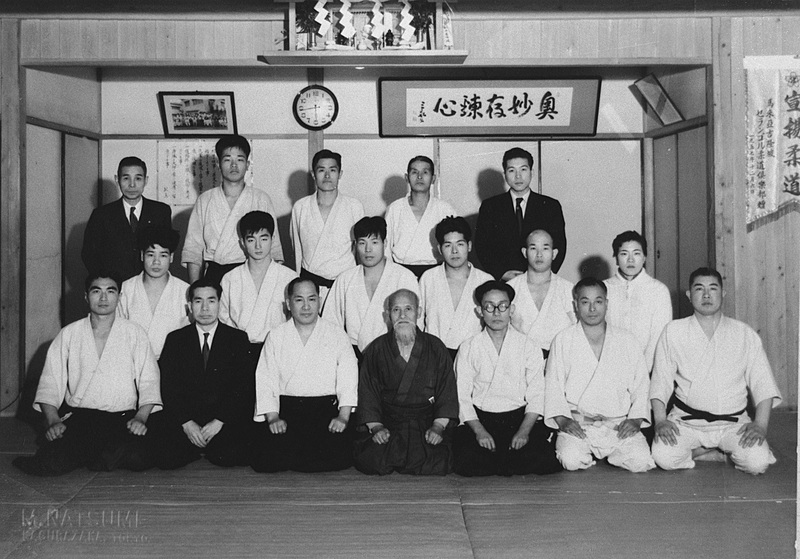 At that time Tohei Sensei was teaching and living at the Suita Dojo in Osaka. 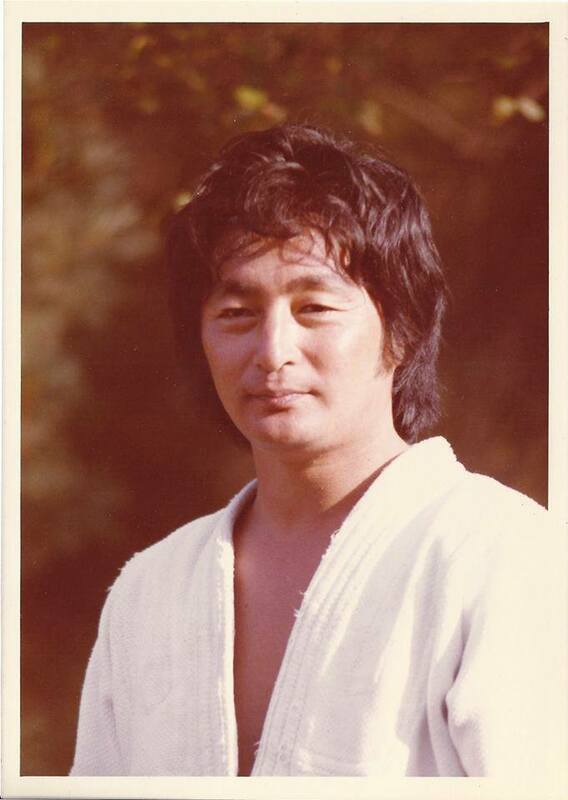 One day Abe said to me, “Now, you are going to witness my challenge to Tohei.” There were just the two of them on the mat, and I was just a kid, sitting in the dojo, watching Abe and Tohei. Abe could do nothing. Tohei Sensei controlled him completely? Right. I still remember it. On the way back I said to Abe, “I thought you were the strongest.” He got mad again. So you were just a little boy then? I was in the seventh or eighth grade. Abe was so mad, the next day he took me out and put me in a kendo suit, even though I was little, and beat me up. It was very frustrating for him. He started quite early in Osaka, didn’t he? I don’t know how he started. I know that his father was an admirer of O-Sensei and Tempu Nakamura Sensei. I can still remember the first time I saw O-Sensei, when I was in the fifth or sixth grade. Abe’s father, Kazo, was one of his admirers and supporters. All I remember is a brief image in my mind of some black thing moving around on the tatami. O-Sensei used to wear a black kimono for demonstrations. Abe’s father invited a lot of rich people to watch. At that time, budoka were like geisha, or like sumo wrestlers. A special event sort of thing? Right. So instead of just giving them money, supporters would invite guests and that’s how they would give them money as *sharei* (honorarium). So this happened in the late ’40s or so? Yes. I was in the third, fourth, or fifth grade. I don’t remember any details. Was this in the Suita dojo? No, in Abe’s private house in Osaka. O-Sensei was in Osaka many times before the war and there was also the Sumitomo Club. Who was head of the Suita dojo? I think it was Tohei Sensei. He was living there at that time. Were you born in Osaka? No, I was born in Tokyo and then during the war, my family moved to Korea because Abe’s father had a large business in Korea. He owned a mountain. In what city was this, do you remember? A little town called Chinju about 200 miles from Seoul. My father didn’t want to be a businessman; he was a newspaperman for the Kyodo News Service. But he had obligations to his adopted father so when he asked him to move to take on the business as manager my father had no choice. My father ran a mining business. We stayed until the war was over. Actually, I call myself Japanese, but if I combine the time in New York with the time in Korea, I have spent more than half of my life out of Japan. You were actually living in the Hombu Dojo for how many years, do you recall? Was it through your connection with Abe? Yes, but he was in Paris already. 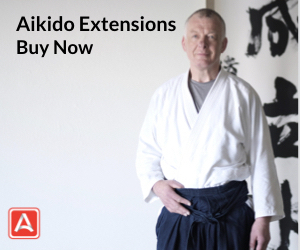 Was aikido something that you wanted to do, or something your family wanted you to do? I wanted to do it. If I didn’t commit myself to something I might have turned out to be a bad boy. 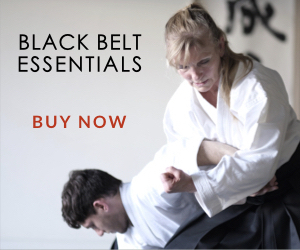 I needed something like aikido in my lifestyle. So I’m glad I did it. Could you give us an idea of the atmosphere in the dojo? Doshu was the main figure. What about Tohei Sensei? Were the two of them like equals? How would you describe their relationship? I think they were good friends then. Tohei Sensei was already going to Hawaii regularly. He was a hero to every one of us. He was strong, he had a good personality, and a very open mind. At that time Tohei Sensei had Osawa Sensei’s position. He would scold us instead of Doshu. We never remember being scolded by Doshu, but when Tohei Sensei scolded us, it was nice. 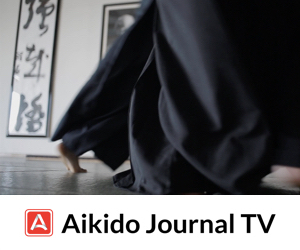 I had to write an article in* The Aiki News Encyclopedia of Aikido* about the development of aikido in Japan, not just in the Aikikai, but in all the groups. One of the things that became clear was the reason the Aikikai is so strong from the organizational standpoint is that it developed a network of university and company clubs in the 1950s. First of all, was there any one person who conceived of this plan? Was it a conscious effort? I don’t think that anybody at Headquarters thought that aikido would become this big. None of us even thought about being able to make a living at it. O-Sensei was spending a lot of time in Iwama when you were first in the dojo. When did he start to come to Tokyo more frequently? When I joined, I saw him quite often in the dojo. He would come down every week or so? Every week. He never planned. He just announced that he would go back that day, and so everyone had to rush to get him to the station. Would you say that after the war, because of its consequences, and also O-Sensei’s age, a lot of people, like at the Yoshinkan, thought he was retired? When you knew him he was already in his seventies. For most people that’s retirement age. Would you say that he was still the focal point of the Hombu Dojo? Yes, I think so. Obviously we were together because of him. Tohei Sensei was still a part of it. So we called Doshu, “Waka Sensei”at that time because still, to us, O-Sensei was the spiritual leader. You mentioned the Tempukai earlier. Tohei Sensei was also involved in that organization. Is that where he got his ki exercises? I think he was influenced by the Tempu system, but those exercises were mainly his own creation after he went to Hawaii. Were you part of the Tempukai yourself? Tadashi Abe was. Not me, but rather Abe. Tempu Sensei and O-Sensei were the only ones for Abe. 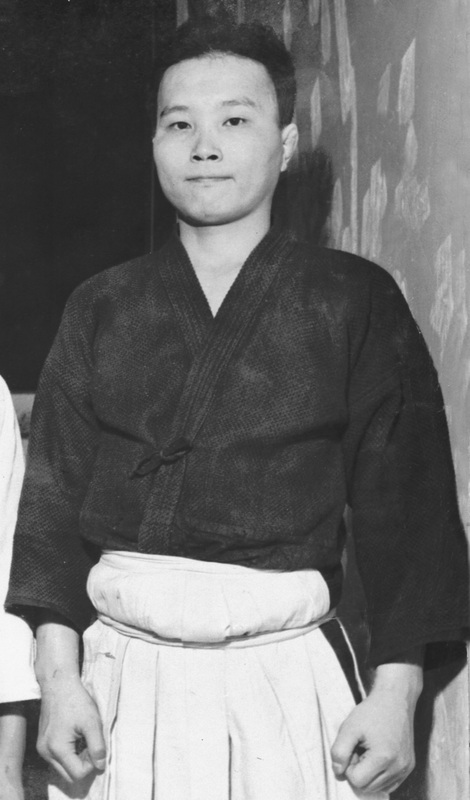 Tohei Sensei was also a Tempukai member. So was my father, and Abe’s father who sponsored O-Sensei, and Tada Sensei as well. Were there any others among the main teachers? There may have been. At that time in aikido there were the Tempukai group, and the group that was involved with the macrobiotics organization of Nyoichi Sakurazawa Sensei [known as Georges Ohsawa in the West]. Was there much contact between O-Sensei and Tempu Nakamura or Nyoichi Sakurazawa? I didn’t witness anything. But I was just a young kid. I know that many big shots visited O-Sensei because I had to wait at the entrance, but at that time I just wouldn’t know. What led to your going to America? As a young kid, I liked American culture. I liked American songs. I grew up in Zushi where there were many American kids. At that time Zushi and Hayama had a special atmosphere. We had a very western culture. Was there an American base nearby? Yes, Yokosuka. We used to communicate with American school kids, so that’s why I spoke English. 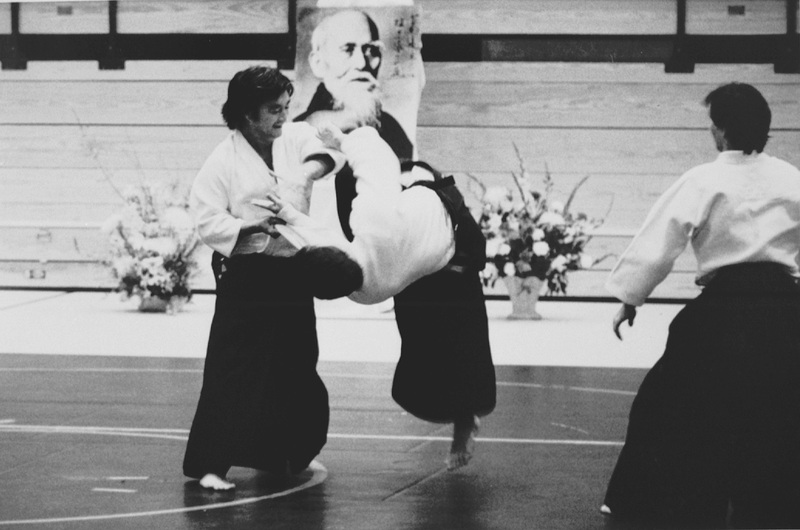 At that time all aikido outside of Japan was controlled by Tohei Sensei. So when this woman called Virginia Mayhew came to Japan, my family and I took care of her personally and we became friends. Actually I wanted to go to Paris, because of my connection with Abe. But because I spoke a little English, I went to New York. I’m glad I made that choice. Also because I spoke English I taught at American bases everyday. That was a big thing for Headquarters. What bases did you go to? Camp Zama, and I went in Yokohama to the special services housing center. I already knew how to deal with Westerners. It was nothing new for me. 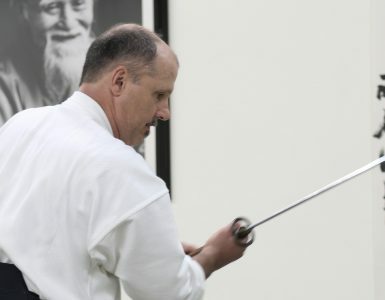 You were the first permanent Japanese teacher in the United States within the Aikikai system, I believe. Actually, there was nothing at all on the East coast. I even used to go to Chicago, and Boston too. Of course at that time nobody had any money, so travel was done by Greyhound bus. I commuted every Monday to Boston. I would leave New York about noon, and would get there by evening, teach a class and then take a midnight bus back to New York, getting in early in the morning. Finally there was a small regular group there, so I invited Mitsunari Kanai. That’s how he started. He came, was it, 1966? So you needed some help on the East Coast? Well, Boston had enough people to support a teacher. So you went to Boston fairly regularly for two years. I also went to Philadelphia quite often. Once in a while I went to the South or Florida. When did Shuji Maruyama arrive in Philadelphia? Actually, he first went to Cleveland. I have written here March 1966. And then he went to Philadelphia afterwards? After his contract expired in Cleveland he moved to Philadelphia. Then Kanai and Maruyama and I worked together for a while, until the split with Tohei Sensei and Maruyama had to go with him. 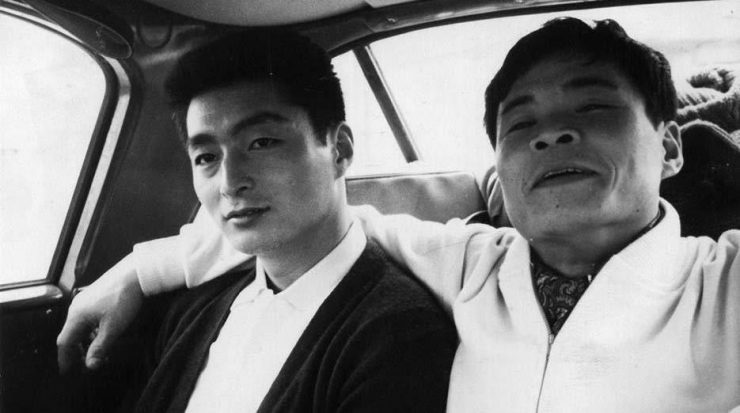 Apart from the fact that aikido was not very well-known when you went to America in 1964, and the fact that you had to take a bus everywhere, what were the biggest problems, perhaps psychologically, that you encountered in getting aikido going in those areas? Well, simply that aikido was unknown. You had to explain what it was about? Yes. The only way anyone had heard of aikido was from a book, maybe written by Tohei Sensei? I believe Tohei Sensei and Doshu had books translated into English in the early 60s. At that time in the Western world, aikido equalled Koichi Tohei. He was better known than O-Sensei at that time, wasn’t he? He was more famous than O-Sensei in Hawaii. At that time Tohei Sensei was treated like a king. You published a book fairly early yourself. Was the first one in the late ’60s? Yes, I think so. It is still on the market, although it is a lousy book. 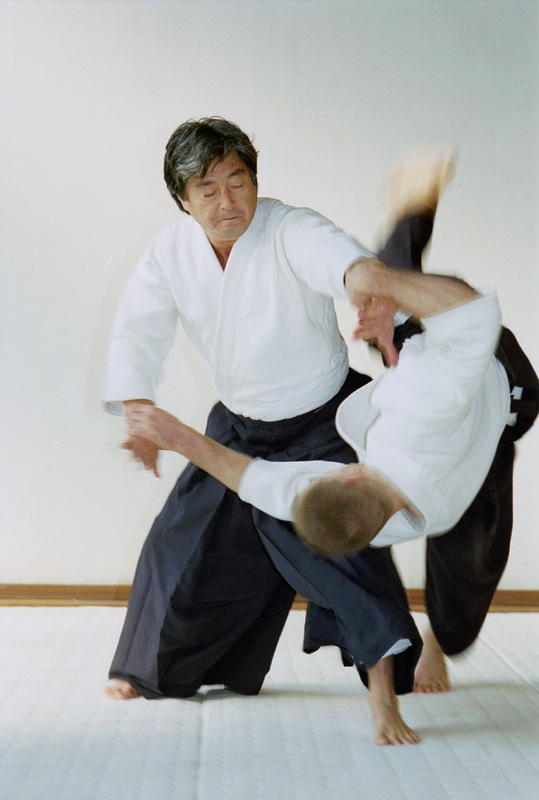 The pictures are bad because the photographer knew nothing about aikido. But some American people who didn’t have any knowledge about aikido had already started thinking and talking about publishing a book. So I thought, I had better do it. 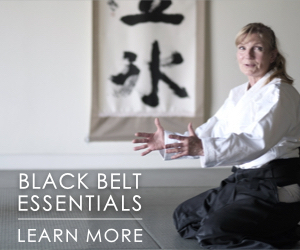 Now it’s okay, because other people do know about aikido. But then I didn’t think it was a good idea. Sensei, I believe you started the New England Summer Camps many years ago. When was the first one held? More than 20 years ago, I think. I remember I started holding training camps when I had about twenty people. Upstate New York. My first guest was Tohei Sensei. I don’t know how I managed financially. One time he stayed in New York for four months. I put him in a hotel. ’65 or ’66. Even though I couldn’t even support myself, I had to pay for him in the hotel. I didn’t have so many members then. I don’t know how I paid my own rent. But I invited him many times, and we went to Chicago and Cleveland. We were poor but we had a good time. I still respect him. He was a great inspiration to hundreds of people. Do you still see him sometimes? The last time I saw him was a few years ago. He still likes me, I guess, though I don’t know why! Oh no. He understood my situation. Everybody understands… Chiba and Tamura Sensei, that I should be the go-between. They have asked me to do so because they want to maintain some kind of relationship. This concludes Part 1 of the interview. Part 2 will be published in the very near future. 8th dan Aikikai shihan. In 1955, at the age of 18, Yamada Sensei was accepted in the Hombu Dojo uchi-deshi program (live-in apprentice) to study directly with O-Sensei, the founder of Aikido. In addition to O-Sensei, he also studied under Kissomaru Ueshiba, Koichi Tohei and Kisaburo Osawa. An invitation to demonstrate Aikido at the 1964 World’s Fair brought Yamada Sensei to New York City. 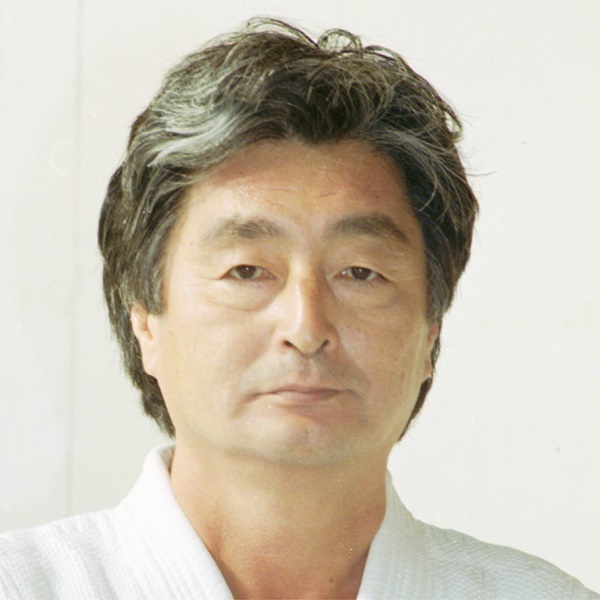 He stayed on to become Chief Instructor at the New York Aikikai and to this day holds that role, as well as the position of Chairman of the United States Aikido Federation, one of the world’s largest aikido organizations.